A sommelier can tell you what’s in a glass of wine; hints of this and notes of that. Licorice, smoke, orange, with an earthy taste. They’re right of course. But, in many other ways they’re very wrong. Here’s how…. When one thinks of the fall harvest, one thinks of sunlight filtered through golden leaves; a lingering summer trailing off in half thought. This fall day was nothing like that. This Friday was Pacific Northwest gray with Pacific Northwest rain, a day more suited for fireplaces than the field. 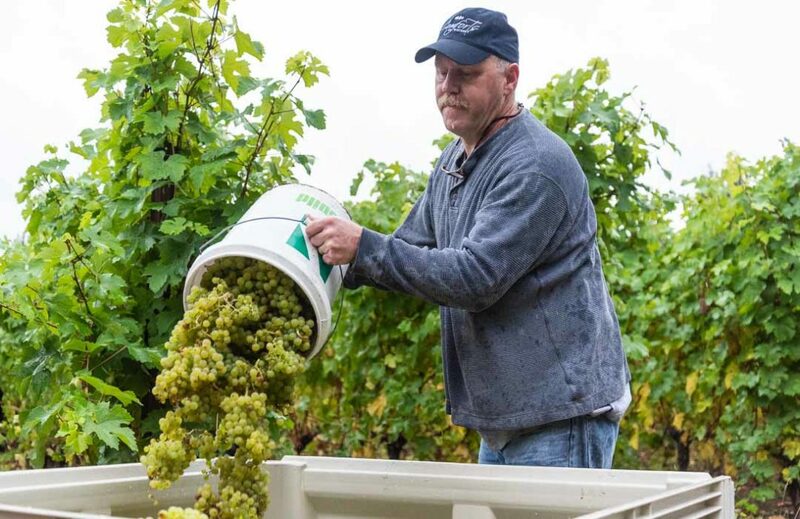 “You’ve got to love the rain,” says Bob Zuver, as he harvested grapes in the vineyard at Comforts of Whidbey near Langley. He sat on one overturned plastic bucket while clipping bunches of grapes and setting them into another plastic bucket. Empty buckets sat waiting nearby. “You should have been here yesterday,” exclaims Rita Comfort, one of the owners. Yesterday had been one of those sunny warm weather fall gems. But, today and the weekend were forecast to be stormy, and at this stage rain is very bad for wine grapes. The impending storm forced Carl and Rita Comfort to reschedule the harvest, moving it up from the weekend. A grape harvest is usually a volunteer event at all wineries around here. Locals and people from the mainland usually exchange a leisurely weekend morning of light labor for a lunch and maybe a glass of wine. Rounding up weekday volunteers was its own challenge, and because of the schedule change, Rita couldn’t promise more than coffee, juice, and fresh-baked banana bread. A grape harvest is usually a volunteer event at all wineries around here. Yesterday was a successful harvest of the Siegerrebe varietal of grapes. Today would be the Madeleine Angevine varietal. Early fall bad weather has cost them a lot of their fruit in past years. They hoped to avoid that this year. “Those grapes are always last” explained Carl as he maneuvered a small orange tractor. Karen Abel was among those picking grapes as the light rain fell. As a neighbor of the winery, she had watched the vines grow. She wondered about the harvest because, from a distance, “I never saw any grapes.” But, up close, she could see there were plenty of grapes ready to harvest. She, Bob, and more than a dozen other people had answered the Comfort’s email. Retirees, people on their day off, and neighbors, each with their clippers, scissors, and buckets, were at work on harvest day two. Karen laughs a bit as she confesses she knows little about wine, but is there to help. The vines tower over her as she clips each bunch. 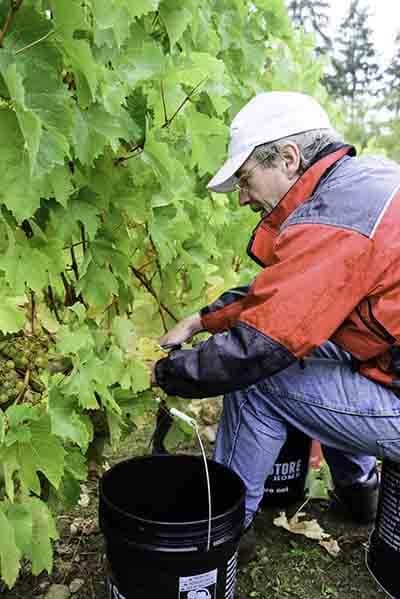 Harvesting wine grapes here — anywhere — is a dare, a gamble against the forecast. One wants to keep the grapes on until their last best possible moment, but early fall foul weather can ruin a whole spring and summer’s work. One by one, the bunches of grapes are dropped in the buckets. Bob is retired and a musician who has performed at the winery. He chuckles as he notes that today is his first time doing something like this. There are other people among the rows; all in raincoats, light jackets, and hats. One woman has brought her toddler along. Maybe she couldn’t get a sitter, or maybe she wanted him to have the experience. He was pulling apart an old leaf as she clipped grapes. Mother Nature fulfills the forecast, and the rain gets heavier as Rita and Carl Comfort work to get the picked grapes loaded. Rita is slowly driving the tractor at the edge of vineyard. It holds a big plastic bin. She stops every few feet and Carl, who is walking behind her, picks up a filled bucket of grapes and dumps it in the bin; the first stage of harvest. In a few hours, maybe a day or so, the grapes will be crushed, and the process of turning them into wine begins. Turning them into something that will one day reach the educated palates of experienced tasters who will sample, judge, and pronounce. They’ll offer thoughts about tastes of this, and hints of that. But, they’ll never taste what else is in this wine. They’ll miss Bob, and Karen, and many others. They’ll miss that note of early fall rain, a hint of owners on deadline, an orange tractor, notes of plastic buckets, community, and laughter.